In the hospital, Ginny and Rose find Larry in the waiting room, being very quiet. Larry has been mildly injured, but he’s cleared to leave the hospital. One of the nurses confides in Ginny that the police will probably be in touch soon: Larry was probably drunk, meaning that he could be charged. Larry has broken the law by drinking and driving; a sign of how far he’s fallen since signing away his property to his children. Without a sense of family connection, he begins abusing his property and his body—he has nobody to live for anymore. Ginny and Ty drive Larry home, and Larry sits in the back, silent. As Ginny sits in the car, she thinks of Jess. Suddenly, Larry groans, and Ty asks him what happened. Ty reminds Larry that the police might try to arrest him soon—he’ll probably lose his license. Still, Larry doesn’t say a word. Secretly, Ginny savors the idea that she and Ty are treating her own father like a naughty child. Ginny begins to show her true motives—motives she’d repressed before now. Ginny, the passage suggests, is just as much in love with the idea of exerting power over her father as Rose is—she enjoys the feeling that she can treat her father like a child, as if she’s making up for all the years when her father looked down on her (or worse). Ty and Ginny take Larry to their home and put him in bed. The next morning they fix him breakfast as usual, and Rose drops by to see him. Privately, Ginny and Rose discuss what to do about their father, and Ginny suggests that Larry should be treated gently. Rose admits that she hates it when Ginny talks about forgiving Larry. Ginny tries to convince Rose that they can continue to “share the work” of taking care of Larry. Ginny recalls that Larry used to be easier to get along with when Mrs. Cook was alive. Rose looks like she’s about to say something important, but then she falls silent. Reluctantly, she agrees to help Ginny take care of Larry. Ginny seems more likely to forgive Larry than Rose is, and yet they’re both seem to enjoy the idea of asserting their power over Larry, albeit in subtle ways. Rose wants to exert her power over her father by ignoring him, while Ginny wants to do the same thing by babying him and treating him like a naughty child. The passage implies that Rose was about to tell Ginny a big secret—the plot thickens. Arn, Jackson. "A Thousand Acres Book 3, Chapter 20." LitCharts. LitCharts LLC, 22 Nov 2016. Web. 17 Apr 2019. Arn, Jackson. "A Thousand Acres Book 3, Chapter 20." LitCharts LLC, November 22, 2016. 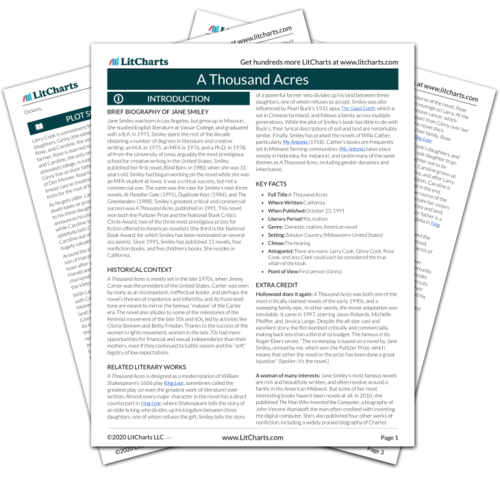 Retrieved April 17, 2019. https://www.litcharts.com/lit/a-thousand-acres/book-3-chapter-20.